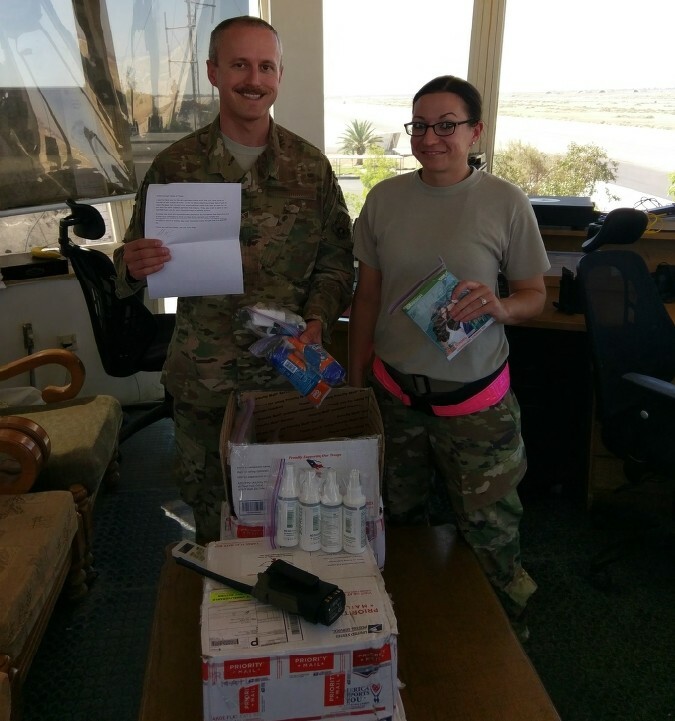 Care Packages for Soldiers: Hot Summer in the Mideast - Troops Grateful for our Care Packages! 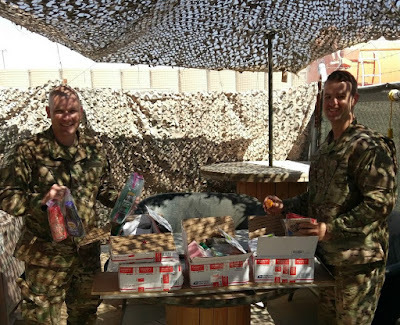 Hot Summer in the Mideast - Troops Grateful for our Care Packages! One of our chaplain contacts at an undisclosed location in the Mideast sent us some wonderful photos of his Troops with our care packages ... Chaplain: "We are very very grateful for all that you and your team do for us". The smiling faces are fantastic! It's an austere base, but it probably wasn't hard to get these Troops to smile while opening all our care packages. Some of the items in the photos include Dunkin' Donuts coffee, Folger's coffee, notes written by the Texas Rangers baseball fans, Nivea shampoo, VO5 3-in-1 shampoo/conditioner/body wash, BioFreeze, Gillete shave gel, Pop Secret popcorn, Bama jelly, and Smucker's jelly. Besides snacks and toiletries, we also included socks (thank you Old Downtown Carrollton merchants and customers), DVD's (thank you Half Price Books), OTC medications, magazines, towels, batteries and much more. The all-volunteer Airborne Angel Cadets of Texas are thankful for all the support of product donors, financial donors and volunteers that allow us to mail so many care packages to deployed troops in remote areas such as Iraq and Afghanistan. And we are always thankful for all who protect our independence by serving in the U.S. Army, Navy, Air Force, Marine Corps and Coast Guard! Click on any of the six images to enlarge. 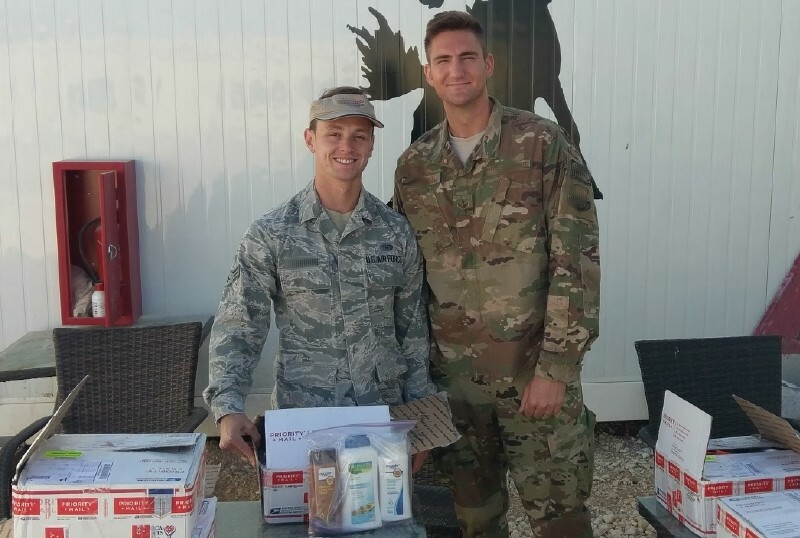 Care packages of the Airborne Angel Cadets of Texas being opened outside. American Troops appreciating the notes and drawings from the youngsters! 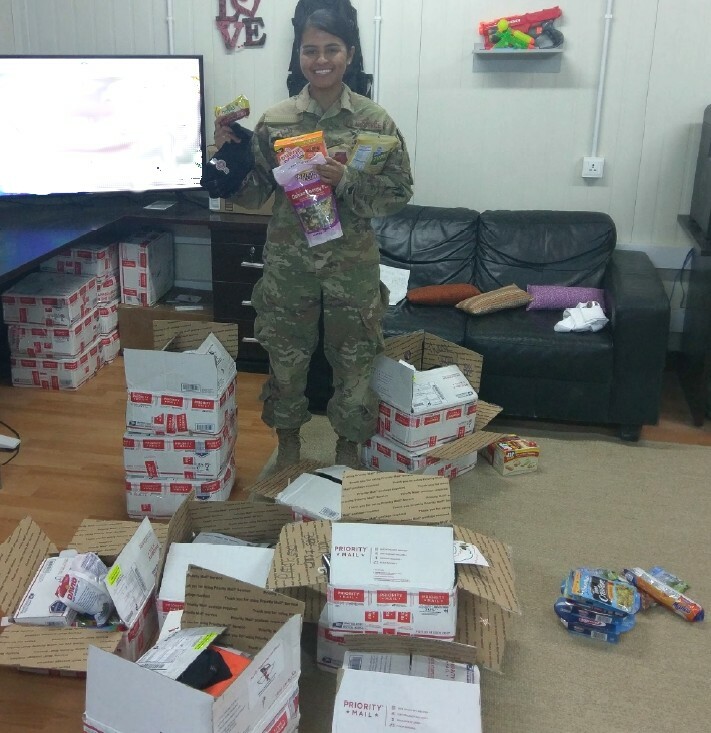 Female Troop enjoying lots of snacks! 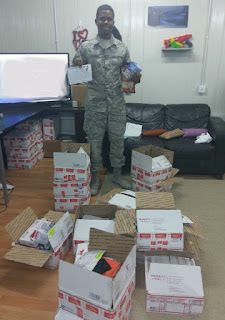 Holding up a note to the Troops and tasty snacks! 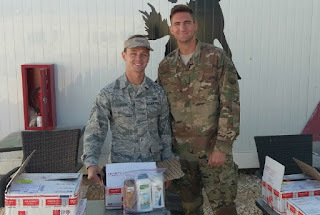 Gillete shave gel, Garnier Fructis and BioFreeze are a hit with the Troops! 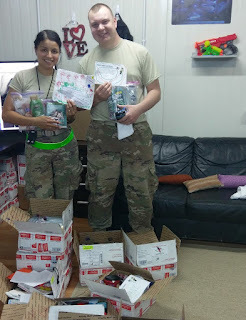 Smiling Troops posing with toiletries and other care packages!